Herti is your reliable partner for developing new products and distinguishing trade-marks in unison with our slogan “Your brand tomorrow is our business today”. Our portfolio includes great variety of aluminum, plastic and composite closures combining unique design with functionality and convenience. We work closely with each client at every stage of developing their product and offer optimum solutions for their needs. Established back in 1993, Herti is now a leading European producer of a wide range of closure sizes with innovative design and numerous decoration options. Aluminum closures form a large part of the visual impression of bottles and their branding. More than 40 closure size types are available from Herti, in diameters ranging from 17mm to 43mm, and heights from 12mm to 6mm. They are used to seal bottles with capacities from 50ml, right up to 1gal. Practically every conceivable dimension of aluminum closure can be manufactured by the company, which also advises on packaging solutions to clients producing wine, spirits, non-alcoholic beverages, olive oil and pharmaceutical products. Closures featuring the HL sign are delivered precisely with consistent quality to more than 50 countries globally. No compromises are made on quality and safety, with every stage of production strictly controlled and only certified raw materials used for products. 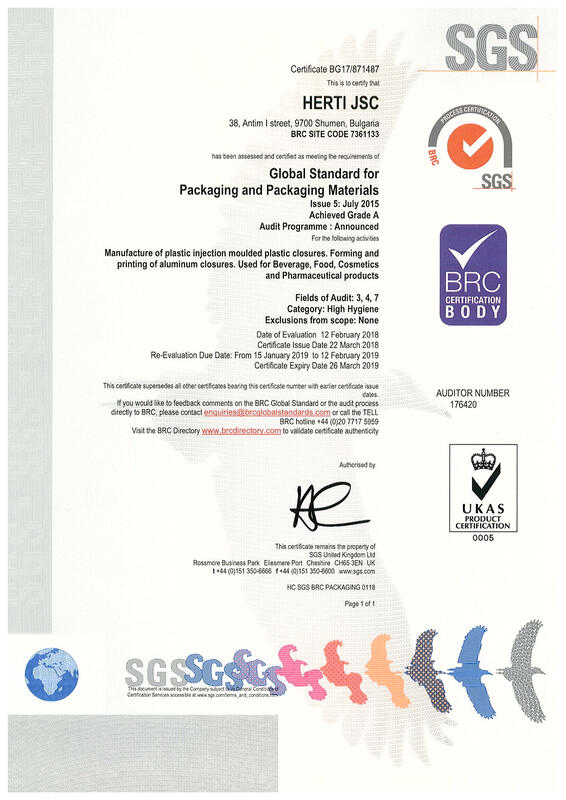 Since 2000, Herti has been ISO 9001 certified, and has had BRC/IOP accreditation for the Global Standard for Packaging and Packaging Materials since 2010. We have the production capacity and know-how to develop new products. To find out how Herti can meet your requirements, send us an enquiry through the form on this page or use the contact details. “Vinstar” is the trade mark under which Herti sales its wine designed aluminium closures. The company offers different liners to ensure perfect air tightness and control of OTR as saranex and tin-saran, which are typical of the wine sector and preferred by producers and also a PVDC-free granulate gasket, suitable for still and fizz wines. We offer a wide range of aluminum and composite closures for bottling spirits with capacities from 10ml to 4.54 l. Closures with EPE liner, typical for the alcoholic drinks, have numerous possibilities for decoration. They give perfect air-tightness and contribute to the attractive appearance of the bottle. For brand safety and to avoid the risk of counterfeits Herti offers composite closures and aluminum closures with non-refillable pourers that prevent the bottles from being refilled. For the market of bottled mineral waters, carbonated drinks and juices, Herti provides different solutions – aluminum and plastic closures – 28x15.4; PCO; 48×41 and plastic handles as well as our latest innovative composite closure named DORADO. The aluminum closure with safety plastic ring is designed for capping high and middle class quality still and sparkling mineral waters in glass bottles. Our new closure “Vinstar Smart” in sizes PP28x44 mm and PP30x60 mm can be an elegant decision for sealing not only wines, but also water, juices and other beverages. Herti started to operate a new warehouse at its production site in Bulgaria. The building covers 2 500 sq.m. and has four loading platforms. It is equipped with two wrapping machines, a reach truck and forklift trucks. The bar code readers and the software allow easy navigation and quick service. The new warehouse is a part of the investment program including establishing new machines for increasing capacity and projects for improving the health and working conditions in the factory. Herti is a sponsor of the Wine and gourmet festival in Plovdiv on 11&12 May 2019. Herti attended the largest responsible sourcing conference of SEDEX , bringing together over 700 business leaders, CEOs and practitioners. The conference was held on 26th & 27th March in London. Sedex is a global membership organization that prides itself on making it simpler to do business that’s good for everyone. As a SEDEX member Herti can use many kinds of different data, standards and certifications to drive continuous improvement across its value supply chains. Once again Herti will be a part of the world’s leading trade fair for wine and spirits ProWein in Dusseldorf, from 17th till 19th of March 2019. Each year, professionals from viticulture, production, trade and gastronomy, from around the world, visit this meeting place No. 1 for the industry to learn about new products and trends. Last year our R&D department developed a new olive oil pourer for smooth pouring of the liquid. We also improved the equipment to increase the capacity for producing olive oil closures. Herti will present the variety of olive oil caps at the Annual meeting of the American Olive Oil Association on February 22 & 23, 2019 at The Westin, Jekyll Island, GA.
Take advantage of up to 20% discount on our stock colors closures during Unified Symposium 2019. Visit our booth #2320 and get a special quote for more than 16 different colors. Get a 5% discount on your design closures with Top Offset Print and a 10% discount on your design closures with Hot Foil Side Print. Stop by our booth and have a look at some artwork examples. Our team can’t wait to meet you at booth 2320. Come to see the variety of sizes and colors of our screw caps. To screw or to cork? This is the question. And Herti can help you with the answer. Do not miss the opportunity of our show specials- up to 20% discount on our stock colors closures, 5% discount on your design closures with Top Offset Print and a 10% discount on your design closures with Hot Foil Side Print. The week before Christmas is the perfect time for inspiration about the holidays. The New Year’s coming brings with it a sense of bright hopes and new opportunities. Wine o’clock is coming. So sit down by the fireplace and relax with a mug of mulled wine. If you find difficulty in opening your bottle just browse our web site for the right screw cap. May your coming days be filled with boldness, creative enthusiasm and joy of a job well done. WIN EXPO is coming up. We can't wait to meet our customers at booth #715 to show the full range of Herti's products and offer amazing EXPO Deals for up to 20% discount on special closures. Herti's screw caps protect the integrity of your brand, communicate quality and ensure authenticity. Visit our booth #715 and find a world of closures, specially created for you. Register today and use the Promo code HER715. Are you planning to visit Bordeaux these days? If so, come to our booth E2508 at Vinitech-Sifel. With 20% of its exhibitors and 15% of its visitors coming from all over the world, VINITECH-SIFEL has, for several years, been considered one of the leading international platforms for future-oriented investments in the vine, wine, fruit and vegetable industries. From 20 to 22 November, Vinitech-Sifel will be confirming its status as the leading international trade show for vine, wine and fruit & vegetable professionals. Our team will be there to answer all your questions. This autumn we launched two new sizes of screw caps for the spirits sector: 20x12 and 36x52. Herti develops and markets new products every year together with its subsidiary company Tihert JSC, specializing in tool production. Our R&D department works closely with the customers in the development of their products and their brands, creating unique and innovative products. Come to booth #715 at WIN Expo and see the full range of our wine and spirit closures. BrauBeviale will take place from 13 - 15 November 2018 in Nuremberg, Germany. This show has taken place in the Exhibition Centre Nuremberg since 1978. Small and medium enterprises and global players from Europe and the rest of the world use the creative atmosphere at BrauBeviale to develop solutions. The exhibition covers the fields of process chain of beverage production, production and marketing of drinks and beverage technology. Our team will welcome you at boothâ715 in The Hall of Flowers to offer you business solutions tailored to your organization. Herti successfully passed recertification on the latest version of ISO standard. ISO 9001:2015 specifies requirements for a quality management system when an organization demonstrates its ability to consistently provide products and services that meet customer and regulatory requirements, and aims to enhance customer satisfaction through the effective application of the system. The certificate is issued by SGS and is valid till September 2021. 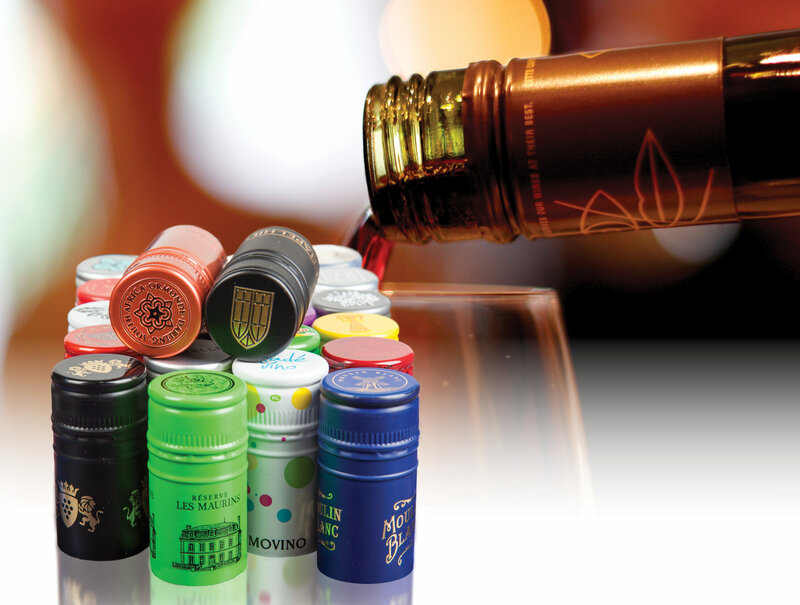 Herti has 25 years of experience in manufacturing a great variety of screw caps for wine and spirits with high quality and perfect technical performance. In November Herti is going to attend three big trade shows in Europe: Intervitis, Braubeviale and Vinitech. Find the screw caps specially created for you at www.hertius.com and visit our booths at the exhibitions. Following its long-term policy of sustainability in quality assurance and customer satisfaction, Herti installed the next vision control system, allowing accurate quality inspection on high speed running machines. The vision systems are part of the management program to continuously improve its products and processes to ensure the highest quality. Herti has 25 years of experience in manufacturing a great variability of aluminum screw caps , combining unique design with functionality and convenience. We work closely with each client at every stage of developing their product and offer optimum solutions for their needs. Since 2000, Herti has been ISO 9000 certified, and has had BRC/IOP accreditation for the Global Standard for Packaging and Packaging Materials since 2010. This month Herti will mark its 25th anniversary. We meet this day with contentment of our achievements and ambition for the future. Herti manufactures more than 1 billion aluminum screw caps per year for wine and all kinds of beverages. Our professional team works closely and actively with the customers and has individual approach to every new design and project. Herti made a new investment at its production site for increasing capacity of 30x60 aluminum screw caps. The equipment will be installed in June and will give the company more flexibility to meet customers’ needs for wine closures in terms of quantity and delivery time. Earlier this year Herti introduced two more lines to boost capacity and give more decorating options. Herti offers 16 stock colors of its wine designed screw caps available in the wharehouse in Sacramento. Herti passed its BRC certificate re-evaluation. The company has accepted the standards of BRC/IOP in the field of hygiene and safety of products and observes its rules since 2010. Herti exhibited its variety of wine closures at the world’s leading trade fair for wine and spirits ProWein in Dusseldorf, from 18th till 20th of March 2018. If you need a trusted partner for your brand protection, Herti will be at WIN Expo on November 30th. Come and find the variety of Herti screw caps that give a perfect match of functionality and unique design. Visit Herti booth № 715 in The Hall of Flowers. Our team will be there to offer you business solutions tailored to your organization and give life to your ideas. The exhibition Simei&Drinktec will take place from 11th to 15th of September 2017 in Munich, Germany. For the first time the two big trade shows are going to join fiorces for an impressive international event. Drinktec is the world's leading trade fair for the beverage and liquid food sector and a platform for innovations and new technologies for the global leaders in the sector. Simei is recognized as the worlds trade fair for wine technology. For several years Herti exhibits its products at both shows and this year will have the chance to meet its present and future customers from the two industries.